Food processing and catering professionals require footwear with a special list of requirements. Health and Safety is of primary importance, and so footwear needs to be anti-slip with a good wide tread pattern, and easily cleanable for maximum hygiene in the workplace. Footwear needs to be comfortable for all day use, and often needs to offer resistance to animal fats and oils. 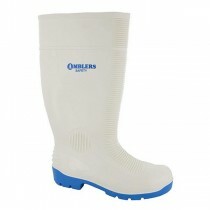 White safety wellingtons are the main-stay of the meat processing industry, and we stock a range of options from all the key brands. 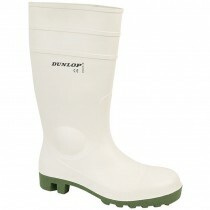 Amblers and Dunlop white safety wellies are priced from a very respectable £14.99. Machine washable white safety boots offer a breathable alternative to the white wellie, whilst not compromising on hygiene in the workplace, and the B422 Food Industry Safety Boot is a firm favourite with caterers.